I have to admit the title of this post is a little bit clickbait-ish, because truthfully I don't really know what meal planning the "hard way" would look like. I get quite a few questions about meal planning, and occasionally I will see one of my friends asking their Instagram friends & family how to meal plan, because the concept just confuses and overwhelms them. I started meal-planning when Jack and I got married, and have been doing it ever since, but it DID take a while to get into the natural rhythm of doing it every week. There are quite a few other resources for meal planning out there, but I wanted to just share my basic process, hopefully to help someone who is sick of over-spending at the store multiple days a week, eating out all the time, and/or just looking for a starting point to meal planning! I think you'll find that it's a lot more simple than you may think. 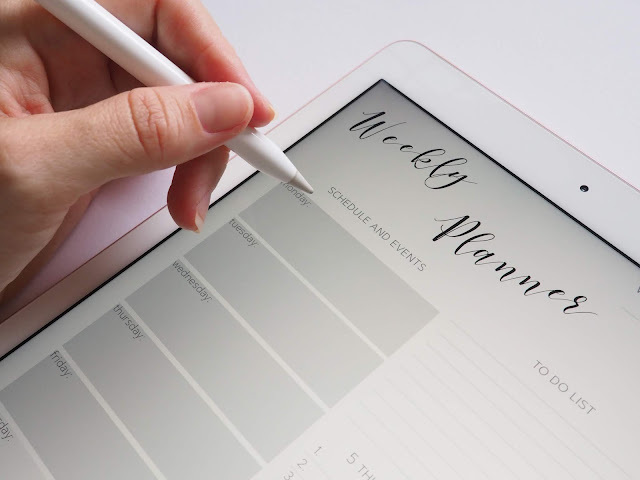 This is the first and most important step in getting into a regular habit of meal-planning, simply because this will define your menu & grocery list moving forward. And the easy part: you only need to figure this out once (unless of course in the future your budget changes). Once you figure out how much you want to spend per week, you can move forward with your menu. This is probably the part that takes the most time, and for me, this step came with a lot of trial and error. If I go to one grocery store, sometimes the prices are jacked up so much that I can walk out with 5 things, having spent $60. Other places, I can spend $60 on most (if not all) of my shopping list. It all depends on what stores are in your area, and what kind of deals AND products they offer. Trader Joe's is my store of choice for a number of reasons: they are consistent in quality, their prices are reasonable for what they're offering, and I can buy everything I need in one location. However, since many of their products are store brand, they do not offer store coupons (they DO however accept manufacturer coupons!). Stores like Sprouts, Harris Teeter, and Food Lion offer weekly deals, store coupons AND accept manufacturer coupons, and also most likely have a deli counter and hot foods, which Trader Joe's does not offer at this time (at least that I know of!) SO, with all of that being said, find what works best for you & your budget. If I'm going shopping on a Saturday, I begin with Saturday, because that night's meal is going to be dependent on the groceries I get on that shopping trip. Got a soccer game on Tuesday and have to eat out? Put it on your plan. Got a work meeting that will run a little later than usual? Put it on your plan. Anything that's going to either interfere with or determine your dinner plans for that night, write it down. This is the part where a lot of people get hung up...because what if you change your mind? What if you don't WANT to eat THAT specific thing on THAT specific day? What if something unexpected happens and you have to eat out? All of those things are totally fine, which is why we're writing this on a piece of paper and not etching it into concrete, ha. You are allowed to switch these meals around, or make one meal on a different day if that works better for you. There's no right or wrong way to do this step, all you need to know is what you & your family like to eat. If it's easiest for you, start on the days where you KNOW your regular dinner time will be compromised. If you're going to be getting home later than usual, plan a crockpot meal for that day that can be cooking all day while you're at work. If you have a short amount of time for dinner before rushing out of the house again, maybe choose a meal that is simple with a quick cooking time (like chicken fajitas or personal pizzas). Once you have those special days taken care of, the rest is a breeze. What does your family like to eat? Is there a day of the week that will give you enough time to try a new or more involved recipe? For example, I LOVE making a whole roasted chicken on Sundays. It takes a few hours to cook in the oven, which is why it's perfect for a slow Sunday afternoon; I've got plenty of time to prepare it and let it cook. You don't have to plan lavish meals or a 4 course dinner for every weeknight. Just figure out what your family likes to eat and write that down - see my example list below! If you're new to meal planning you might be wondering why this is the last step, but this step is actually KEY in making sure you follow through with step 1, and stay within your budget. If you make your shopping list before you meal plan (or not at all) you may find yourself spending WAY more than is necessary. The same is true when you wait until the last minute and make a hurried trip to the store after work to get ingredients for a meal. Once your meal plan is completed, go down your list and write down every ingredient you will need for that specific meal. Don't forget to do a quick inventory to see what you already have - most likely you won't need to purchase EVERY single ingredient you need for every single meal. It's possible to do this for the entire month, and it's also possible to prep food ahead of time (such as freezer meals), but neither of those things are valuable to me and my personal family life. You can absolutely use this method to plan your meals for the month, AND you can use this when determining what freezer meals to prep for the week ahead - this is just meant to be an easy, step-by-step guide to how I meal-plan weekly. Feel free to adapt this strategy according to what works best for you!